Here we explore great ideas on home bar design and construction, decoration and themes, furniture and building a home bar. If you like to entertain at home, a bar is a great place to do so. Home bar design should be practical for both barman/host and guests. You should have sufficient storage available for liquor, spirits, mixers and other ingredients as well as all the necessary bartending equipment. It should be accessible and provide enough space for people to gather to enjoy drinks, conversation and have a good time. Our Home Bar Design Guide gives advise and tips on good home bar design. It also looks at home bar accessories and appliances you might put in your bar. Apart from the bar and the appliances and accessories, you need furniture. This includes bar chairs and can go as wide as couches, pool tables, juke boxes, pin ball machines and electronic coin-op game machines. Our Home Bar Furniture Guide looks at furniture you can put in your bar. The Bar Stools Guide gives advice on bar stools in particular. A home bar lends itself to decoration. Some people take a lot of pride in decorating their home bars with items collected over years. 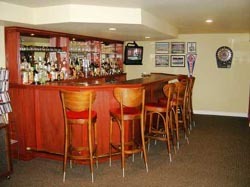 Cap collections are often seen in “pub style” home bars. It is not imperative that you decorate your bar, but you at least want to create some sort of atmosphere. On the other hand, you can decide to go all out with decorating your home bar. There are many home bar decorations and themes. A favourite theme seen across the world is Ferrari, which of course involves decorating your bar with all sorts of Ferrari memorabilia. From flags and caps to scale models of Ferrari cars. Check out our Home Bar Decoration and Theme Guide for more great ideas on home bar decoration. We also have pages on outdoor and modern home bars. For the handy and adventurous among us, there is the option of going DIY. Click here to explore ideas on building a home bar. If you decide to buy a home bar click here for must-have advice. Click here to buy your home bar from Amazon.com.